Universal Studios has officially announced E.T. The Extra-Terrestrial will be released to Blu-ray Disc and UltraViolet on Oct. 9, celebrating the 30th anniversary of the release of the Oscar-winning film from director Steven Spielberg. E.T. 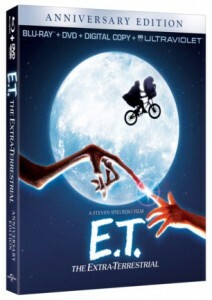 The Extra-Terrestrial Anniversary Edition Blu-ray Combo Pack will include the 1982 theatrical version of the movie, along with a new Steven Spielberg interview, deleted scenes, and “The E.T. Journals” with never-before-seen footage from the set. The Combo Pack includes 4 formats to watch the film. You can choose from high-def Blu-ray, standard-def DVD, Digital Copy, or UltraViolet copy from the cloud. The release of E.T. The Extra-Terrestrial (available for the first time on Blu-ray), also celebrates Universal’s 100th Anniversary this year. The Anniversary Edition Combo Pack is now available to pre-order from Amazon for $23.99 (a savings of 31% off the list price). The E.T. Journals: In this all-new bonus feature, retrace the day-to-day experience of creatingE.T from never-before-seen, behind-the-scenes footage shot by Academy Award®-winning cinematographer John Toll. This piece will give viewers a unique feeling of being on the set and living the excitement of what it was like to make E.T.